I was surprised this summer. Many friends told me how they are facing a depression, a burn-out, a midlife crisis or even an existential crisis. It’s obviously not the first time I have a friend in a crisis, but they were never so many. And this summer it not only happened to people. Quite some political parties are suffering from some sort of identity crisis, not to mention the British Labour party or the Republican party in the US. Even on a much larger scale, like that of the European Union, crisis is the only word we hear. From Euro-crisis over Grexit to today’s refugee crisis. So I started to wonder if there might be a link between all these different crises? Moreover, could it be that the entire world is facing some kind of crisis? Since the nineties we all assume that the world is becoming more democratic, more open and more globalized. So I was intrigued when a European business man told me how he and many of his colleagues have stopped their investments in China. Of course, one business man’s decision doesn’t make a trend. So, I decided to do some research around the question if it could be true that world is becoming less instead of more global. 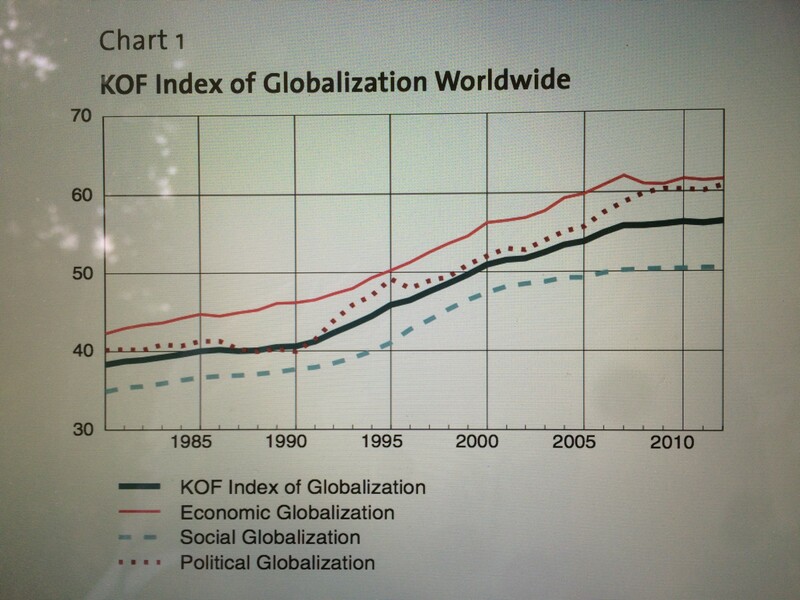 This is how I found the Index of Globalization of the KOF Swiss Economic Institute. This Globalization Index shows an unsettling but clear trend, and this for the first time since 1980: it shows a decline of globalization. Their index is based on facts and figures that make a difference between economic, social and political globalization. The political stagnation starts in 2008. This seems logical as the world has seen a major financial and economic crisis with effects on all fronts. However, the economic and social stagnation started on 2007, before the crisis. The index of 2015 (published on 5 March 2015) only takes into account the facts until 2012. It seems pretty clear that there has been no reversal since then. We can state that the world faces the end of globalization since more than 8 years. In this study, and elsewhere, there are a lot of parameters that explain the economic reasons for the end of globalization. However, as the stagnation of globalization started before the economic and financial crisis, it seems that something else than only economics is a cause of this. Certainly the end of social globalization is rather surprising as it goes against what we hear and feel every day. My assumption is that the cause is psychological. Important traumatic events have plunged people all over the globe into an identity crisis. Their response is tribalization: going back to the tribe they know best. Compared to ten years ago the mindset of the world’s main powers has drastically changed. In 2005 events pointed into a strengthening of international cooperation. President George W. Bush appointed Condoleeza Rice, the first black woman in US history, as Secretary of State and pledged for a new, more multilateral foreign policy. The European Union had its referenda on a European Constitution, a major step forward in the European integration. The Kyoto-protocol was ratified by Russia and became the first global climate action plan. Chinese president Hu Jintao met for the first time since WWII the leadership of Taiwan’s historic party, the Kuomintang. In the Middle East too 2005 was a year of hope. The assassination of Lebanon’s prime minister Rafiq Hariri didn’t lead to a new civil war, but to a democratic Cedar Revolution. Egypt changed its constitution and held its first presidential elections. Iraq held a referendum on its new constitution and seemed to fulfill the democratic promise of the US-led invasion. Israel agreed on a ceasefire with Palestine and withdraw its troops from Gaza. Today, hope has turned into despair. Longtime policies seem to have failed. Capitalism, the biggest winner after the collapse of the Soviet-Union in 1991, lost a lot of its legitimacy with the financial and economic crisis of 2008–2009. One of the key symbols of European integration, the eurozone, almost fell apart. A new authoritarian Russia invaded Georgia in 2008 and Ukraine in 2014. China went back on its promises and stopped the democratic process in Hong Kong. In the Middle East and North Africa the democratic hopes after 2005 and the Arab Spring of 2011 have led to civil wars in Syria, Libya, Yemen and Iraq, and even worse the creation of the Islamic State. Climate change has fallen to the bottom of the international agenda. For two decades the world seemed to be convinced that all indicators pointed in the same direction: more democracy, more economic openness, more human rights, more international cooperation. Optimists believed it would happen fast, while pessimists warned of possible setbacks. But almost everyone thought the direction was clear. Even though there were disagreements about the strategy, reaching the goal of a more liberal world order seemed to be just a matter of time. Not anymore. The anti-forces of the liberal order, authoritarian nationalism and religious extremism are back with a vengeance. The most obvious example of the return of authoritarian nationalism is Russia. The same trend is also clear in most member-states of supra-national Europe, not the least in Hungary and Greece. Religious extremism is on a scary height in the Arab world, but also in parts of Africa, India and Myanmar. The US and Europe seem to be too tired and powerless to halt this decline. Even though both liberal powers know what they want, both are deeply divided. It looks like both powers are facing a global system failure and have no idea how to deal with it. Both know that their influence and power is not what it used to be, but they haven’t found a new role yet. It’s not an exclusive Western problem. The entire world is plunging into an identity crisis. An identity crisis or existential crisis is a psychological state of mind of — mostly high-achieving individuals who feel depressed, angry and lost and question the very foundations of their lives. It usually occurs after a traumatic experience such as an extreme disappointment, a broken relationship, the death of a loved one or a sudden loss of status. These traumas result in a loss of confidence and self-esteem. In trying to find a way out of this depressive disorder people tend to take four different paths: anchoring, isolation, distraction and sublimation. Isolation is an attempt to keep all negative feelings outside. Distraction is trying to prevent the mind from turning on itself. Sublimation on the other hand is refocusing on positive energy in order to keep the negative away. However, the path that most people with an identity crisis are taking is the one of anchoring: finding a well-known fixation point such as religion, closed social groups or one particular idea or ideology. People are looking for the security and warmth of a group, or what I call a tribe. In Arabic there is a word for this: qabaleya, or tribalization. It is the choice to go back to the tribe, its warmth and clear-cut identity. What’s interesting is that psychologists have found that in looking for a way out of an identity crisis people often prefer a negative identity rather than a weak identity. What counts for individuals counts for groups as well. It makes sense to say that societies can suffer from an identity crisis too. The first study of the psychology of the masses was written in 1895, by Gustav Le Bon in his book ‘Psychologie des foules’. Since then many Social Psychology studies have drawn similarities between the psychology of individuals and that of groups. 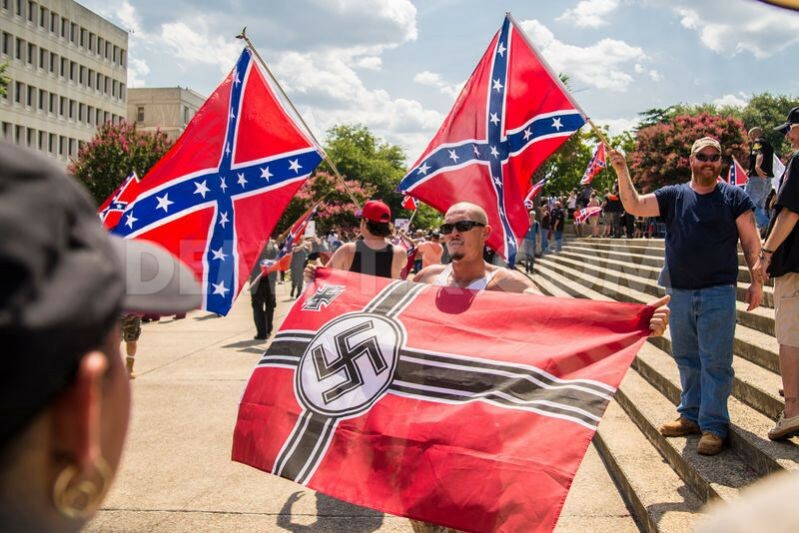 Psychiatrists too have been researching how groups can suffer from a kind of equivalent of the mental disorders usually only attributed to individuals. Psychiatrist and politician John Lord Alderdice even suggested psychologically informed strategies to address such crises in the psychology of large groups including the regressive pattern I am calling tribalization and other phenomena such as fundamentalism, radicalization and the cycle of terrorism. Societies — just like individuals — can suffer traumatic experiences too. The anthropological study of René Girard shows how traumatic experiences make tribes focus on their core identity, returning to a stronger emphasis on law, culture and the sacred, and how they deal with their fear and aggression by turning against ‘the Other’ — the scapegoat mechanism. Just like individuals societies often respond to traumatic experiences with an identity crisis by regressing back into what they know best from the past — what I am describing as tribalization. They go back to the tribal (old) ideas and tribal (old) behavior. These tribal ideas are mostly based on myths of a great past as the only way towards a great future. Tribalization is a process that almost always includes the creation of enemies. The fight against external enemies is essential, while internal enemies are the ‘traitors from within’ as they are weakening the tribe in their existential battle. The 1930s are the most obvious example of this tribalization process. After the traumatic experiences of the First World War and the crash of Wallstreet in 1929, people in Europe felt lost in many ways. Huge masses became part of ‘anchoring’ or tribal movements such as fascism, authoritarian nationalism, communism and the Catholic Church. People found a new sense of purpose, a new identity by going back to the tribal myths of a glorious past. The creation of external and internal enemies lead to genocides and mass purifications. The crisis of the 1930’s contributed to one of the most destructive tribalizations in world history. The world’s new wave of tribalization is a predictable answer to several traumatic experiences and a loss of confidence and status. There were obvious traumatic events like 9/11, the bombings in Madrid, London and Istanbul which created a sense of vulnerability within Western societies. The military response in Afghanistan and Iraq turned into a failure. Torture centers like Abu Graib in Iraq and Guantanamo in Cuba made people question the moral superiority of the West. A new major traumatic blow to the Western order was the financial and economic crisis of 2008–2009. The economic system in which people had put their money and trust appeared to be based on many lies. This system failure ended economic growth in many countries around the earth. In China political and economic change was only possible because of growth and the promise of progress. Russia had to deal with its traumatic transition after the collapse of the Soviet Union. These are not just events. They were serious blasts to the system and to the values in which people believed. When societies and countries lose direction and face identity crises, they tend to look back. They dig through the old sandbox of ideas and beliefs that seem to have worked in the past. For societies, just like for people, a loss of status is hard to swallow. So instead of looking forward, societies look back to what they believe was the basis of some past grand status. This anchoring in myths of the past, this use of old discourse is exactly what we are witnessing in the world of today. Unfortunately, but not unsurprisingly, this new wave of tribalization goes hand in hand with the so-called fight against external and internal enemies. The most obvious example of a regional identity crisis is the Arab World. 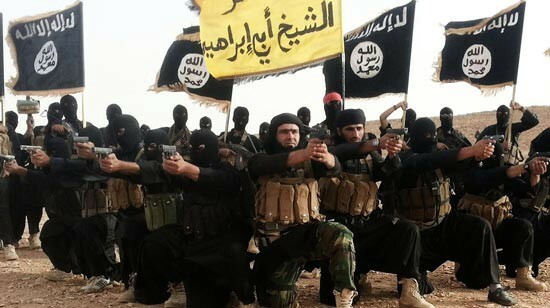 The creation of the Islamic State is only one recent extreme result of this crisis. The first traumatic experience in the Arab World dates back to 1799, when Napoleon invaded Egypt. The Arabs didn’t know much about Europe at that time. They still lived in a dream of military and moral superiority. Napoleon crushed this dream by easily defeating the Ottoman Egyptian army and bringing in scientists who were far ahead of anything the Egyptians had seen. It triggered an internal battle between modernizers who believed the way forward was to learn from Europe and Islamic conservatives who were convinced that the reason for the Arab weakness was the fact that they left the path of real Islam, the one from the early days of the religion. This battle between modernizers and Islamists sharpened in the 1920s when Atatürk created a secular Turkey. He abolished the Ottoman Sultanate and — more importantly — the Caliphate in 1924. For the first time since that start of Islam there was no more official successor of the Prophet. The reaction of the Islamists quickly followed. In 1928 the Egyptian teacher Hassan Al Banna founded the Muslim Brotherhood with one goal in mind: the re-installation of the Caliphate. Ten years later, the Muslim Brotherhood had one million members in Egypt alone. The movement would spread over the entire Arab world in only two decades. However, modernizers still had the upper hand. Until the 1950s liberal parties modernized the Arab World, but they lost credibility as they failed to push the colonial powers out. Socialist and Baathist parties succeeded in gaining independence and reforming the elitist economy. The Egyptian leader Gamal Abdel Nasser created enthusiasm all over the Arab World with his independist, socialist and pan-Arabist ideas, even though he killed liberalism and democracy. The inglorious defeat of the Arabs by Israel in 1967 discredited all secular ideologies, and opened the way for Islamist conservatives. The oil money of Saudi Arabia, the holy war against the atheist Soviet Union in Afghanistan, the foundation of the Islamic Republic in Iran and the peace treaty between Egypt and Israel in the 1970s also pushed extreme Islamism to a higher level. The US invasion in Iraq in 1991 lead to the creation of Al Qaeda, the one of 2003 to all kinds of violent extremist groups. However, for the large majority of Arabs this was not the way forward. They chose to revolt against their own dictators in the revolutions of 2011. All revolutionary forces knew what they didn’t want, but they were divided on what should replace these dictatorships. Then the Muslim Brotherhood stepped in, failed miserably and lost its credibility. Most Arabs feel totally lost now. All ideologies are broken. Not one has fulfilled its promises. They don’t know anymore what to make of their religion. The ones with the deepest identity crisis see the Islamic State as the last resort, in the Arab World but also in Europe. It is no doubt the most extreme example of tribalization and people’s preference for extreme negative identity over a weak identity. For all the other Muslims, the Islamic State is proof of the lack of new ideas. As long as these ideas are not there, most Arabs don’t know what to choose anymore: stability or democracy, religion or secularism, pan-Arabism or nationalism, looking to the West or turning away from it. Traumatized and lost, most Arabs go back to the tribal idea they know best: authoritarian nationalism. This is obvious in Egypt where president Sisi and the military are ruling with force. The Egyptian experience strengthened other authoritarian rulers, such as the kings of Saudi Arabia, Morocco and Jordan and the regime in Algeria. It makes the Arab World a telling example of the two main roads of tribalization: authoritarian nationalism and religious fanaticism. Both are each others biggest enemy. The nationalists blame the Islamists for putting their religion before their country while the Islamists blame the nationalists for putting their religion second. The propaganda war between the two camps shows that what we are seeing today is only the beginning of a deep and destructive regional conflict. During history Europe experienced many identity crises. The current one goes to the heart of the European Union. European integration was the answer to the former identity crisis, the one in the 1930’s. The founding fathers of the EU saw unification as the only way to avoid another devastating war on the European continent. It became a success story, unseen in history. For the first time former enemy states gave up parts of their sovereignty voluntarily. Even more, it turned poor dictatorships into prosperous democracies. European integration was the ultimate answer to ideas such as fascism, authoritarian nationalism, communism and racism. The common market became the source of a shared European prosperity. The fall of the Berlin Wall in 1989 was a victory of the European idea. It proved that people from all over the European continent wanted to become a part of this dream. Fifteen years later, on May 1, 2004, eight of the 11 former communist countries had joined the European Union. This enlargement into Central and Eastern Europe created some fear in the minds of the people in Western Europe. Populists told them it would open the gates for organized crime and a wave of low-cost unemployed workers. Parties on the extreme right won up to 20% and more in elections in Belgium, The Netherlands, Austria and France. In December 2004 the European Union decided that membership negotiations would start with Turkey. This sharpened the debate in Europe about whether or not a Muslim country could be a member of the European club. The old, historic fear for Islam, the religion that twice tried to conquer Europe, woke up again. This was only three years after the 9/11 attacks, one year after 27 British people were killed in car bombings in Istanbul and a few months after the Al Qaeda bombings in Madrid. One year later, in 2005, the bombings hit the heart of London. Not only the extreme right opposed Turkish membership, German chancellor Angela Merkel and French president Nicolas Sarkozy were both elected on a promise to oppose Turkish accession to the European Union. It was in this political climate that France and The Netherlands, two founding members of the European Union, rejected the European Constitution in a referendum in 2005. This Constitution was meant to be a next step to European integration and would make decision making in the EU more efficient. But people seemed to have rejected the ‘officializing’ of European symbols as the European flag, the anthem and the word ‘constitution’ itself. The European Council of ministers had to replace the Constitution with a far less inspiring Lisbon Treaty. The most traumatic experience was still to come. In 2008–2009 the financial and economic crisis did hit the European Union hard. The Euro and the eurozone were not prepared for this disaster and almost collapsed. For months it seemed that Greece, Portugal, Spain, Ireland and even Italy would go bankrupt. The reaction of the European leadership was hesitant. The North European public opinion didn’t want to pay for the mistakes of the European South. The slow answer to the crisis made it into a lasting problem, up to today. In many hearts and minds the European dream was broken. In all following elections anti-European parties and authoritarian nationalist parties became prominent political players. In the European elections in 2009 they obtained only 63 of the 751 seats in the European Parliament, in 2014 that number raised to 99, an increase of more than 50 percent. Another system failure in the European construction became blatantly apparent with the crisis in Ukraine. Ukrainians didn’t accept that president Yanukovitch canceled an agreement with the EU and signed one with Russia. On the so-called Euromaidan in Kiev, people wanted to be part of Europe, not Russia. Europe was flattered but didn’t know how to react. When Russia invaded the Crimea and Eastern Ukraine the European Union was not prepared. Many Europeans even said Russia had the right to have its sphere of influence. European integration is in danger. Traumatic experiences have raised questions in the minds of many Europeans whether the EU is the problem rather than the solution. There are voices to leave the eurozone and in the case the UK leaves the EU itself. Fearing Russia Eastern European countries ask for a new militarization. Feeling lost and anxious they go back the old European tribal ideology: authoritarian nationalism. Nationalist and even racist parties in almost all European countries are calling for less European integration. For the first time since WWII racist mass demonstrations are seen in Germany. 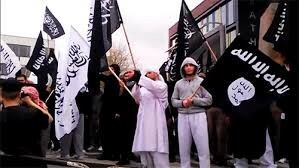 This time the enemy is not the Jew, but the Muslim, whether he lives inside or outside Europe. The current refugee crisis will make things only worse. Tribalization is hitting again in the heart of Europe. It is further weakening the EU internally and externally. It’s hard to say how this is going to end but a disintegration of the European Union may be around the corner. The fall of the Berlin Wall in 1989 and the implosion of the Soviet Union two years later were only the start of a deeply traumatic period for Russia. 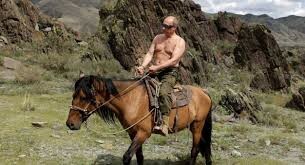 Mother Russia, one of the two world powers for half a century, suddenly became this incurable ill child. The world, and notably the West, came to Russia with economic shock therapies in order to reboot the economy and integrate it in the global capitalist system. At the same time the country made its transition from authoritarian rule towards democracy. As almost every democratic transition the process was chaotic. It’s hard to overestimate the confusion it brought into the minds of the average citizen. Suddenly, everything they had learned, everything they believed in, everything they had worked for had vanished. For many Russians, the mental transition was simply too big to handle. Few countries in history have felt more lost than Russia in the 1990s. The trauma of lost status wasn’t limited to the country itself. Most Russians could deal with the idea that former communist states and even countries that were part of the Soviet Union, like the Baltic states, joined the European Union. This was seen as a peaceful and merely economic bloc. But it was hard to swallow that the same countries also joined NATO, a historic, military, enemy alliance against Moscow. Russia was losing one part of its old empire after the other. When the countries and regions around the Black Sea started to move in the same direction, red lights went on. The only still functioning remnant institution of the Soviet regime, the secret service FSB, organized a silent coup and brought one if its peers, Vladimir Putin, into power. Putin’s mission was clear from the beginning: restore Russia’s status. For that mission he preferred Russia have a negative identity above no identity at all. The first goal was to stop regions and countries from breaking away from Russia and its so-called sphere of influence. The second goal was to bring Russia back to the world’s center stage. In order to reach these goals Putin is warming up the old myth of Russia as the successor of the fallen Byzantine and Roman empire. This imperial dream, with the Orthodox church in the heart of it, is obviously being blocked by the old enemy: the liberal West. As in the Tsarists and communist times, the enemies from within are the liberals who are stigmatized as being agents from the West. Putin’s tribalization strategy is not only popular with Russians, who seem to be happy that their country is again stable inside and feared outside. In the Arab world and in Turkey new soft dictators are learning lessons from him. Now president of Turkey, Recep Erdogan, was elected after having served his maximum term as prime minister. Together with current prime minister Ahmed Davutoglu, Erdogan is looking back to Turkey’s pre-Atatürk Ottoman past, where Islam was a pillar of the state. Erdogan too has created quite a lot of enemies: the liberals, the Gülen supporters, the army, Israel and now Egypt. Putin’s strategy is even popular in Europe where the extreme right finds in Putin an ally against liberal democracy of the ‘decadent’ West. It is hard to overestimate how the tribal strategy of Putin’s authoritarian nationalism is hurting the cause of human rights and democracy on a global level. The United States is still the only superpower in the world. Yet in the past 15 years it has suffered some major traumatic experiences. Ten years after its historic ideological victory against the Soviet Union, it was hit in the heart of its identity on 9/11. The new enemy was not another superpower, but a small guerrilla-like organized group of fanatics. This first foreign attack since Pearl Harbor was an obvious blow to American’s trust in their security system and — more basically — to their feeling of safety at home. However, a more important trauma followed in the American answer to this attack. The United States didn’t succeed in bringing both the invasions in Afghanistan and Iraq to a good end. The impossible war in Iraq caused a crack in the prestige of the US military. The fact that no weapons of mass destruction were found in Iraq made it an unjust war for many. On top of that, the stories and pictures of torture in the prisons of Abu Ghraib, Guantanamo and the secret CIA flights raised many questions about the claimed moral superiority of the United States. More problematic was (and is) that no strategy seems to work. Staying in Iraq seems like a bad idea, leaving Iraq appears to be even worse as it creates the vacuum that the Islamic State has used to put in place its barbaric rule. The combination of these traumatic experiences made many Americans plunge into an identity crisis. The high-achieving country par excellence has lost a great deal of confidence in a relatively short period of time. More importantly, there is no clear way out of this. In the United States too, the result is tribalization. More people than ever are in favor of a new kind of isolationism. PEW Research shows that not less than 52 percent of the Americans thinks that the US “should mind its own business internationally’, the highest score since the research started in 1964. However, an even more important trend is that people, feeling lost, are entrenching themselves in the tribe they know best: their party. Everyone who is following American politics and media sees the increasing polarization between Democrats and Republicans. A fascinating study of PEW Research confirms this deepening rift. Compared to 1994 one sees that the middle ground between Democrats and Conservatives is disappearing: “Twenty years ago, the median Democrat was to the left of 64% of Republicans, while the median Republican was to the right of 70% of Democrats. Put differently, in 1994 23% of Republicans were more liberal than the median Democrat; while 17% of Democrats were more conservative than the median Republican. Today, those numbers are just 4% and 5%, respectively.” In other words, Democrats are becoming more liberal while Republicans are becoming more conservative. 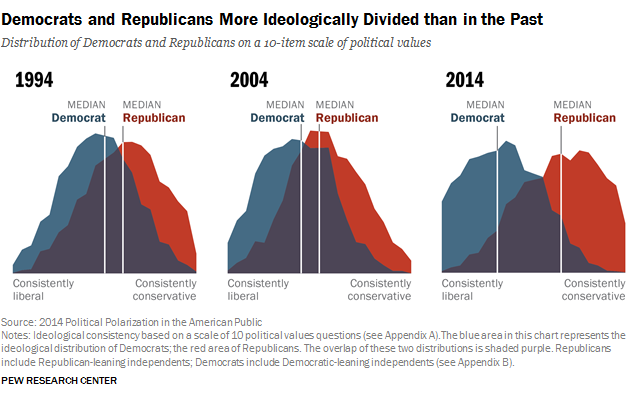 Interesting is also that while Democrats have increasingly become more partisan since 1994, this trend only started after 2004 for the Republican side. Even stronger, between 1994 and 2004 Republicans became less partisan. By 2014 “the GOP ideological shift has matched, if not exceeded the rate at which Democrats have become more liberal”. Maybe more worrying is the growing antipathy between the two camps. In 1994 16% of the Democrats had a very unfavorable opinion of the Republican party. In 2014 that number more than doubled to 38%. In the same 20 years the group of Republicans that saw the Democratic Party is very unfavorable exploded from 17 to 43%. This pattern not only reflects political views, it also appears in the personal life of many. More and more Americans have friends only within the same camp. Party affiliation often determines the news channel one is watching, while these news channels are becoming more partisan as well. Even religious belief is increasingly determining party affiliation. Evangelical Protestants are more than in the past joining the Republican Party, while the religious unaffiliated are becoming more Democrat. This tribalization is hurting the United States. It has become more difficult to pass legislation in Congress. It also hurts American foreign policy. When G.W. Bush was US President, Joe Biden was defending the president’s foreign policy during a visit to Brussels. This year 47 GOP Senators wrote a letter to Iran’s supreme leader to warn him that they could cancel the agreement Iran made with the Obama administration. The start of the presidential campaign for 2016 already makes it clear that this tribalization trend is not going to be reversed in the near future. Asia has not been hit by traumatic experiences of the scale of the other continents in the past twenty years. However, it seems that many Asian countries are struggling with their identity. The cause is economic. Asian economic growth is still higher than in most other parts of the world, but it is slowing down. Contrary to popular belief, we also see a clear end of globalization in Asia. For many smaller countries in East-Asia the fear of a rising China is also influencing discourse. Many elements are already in place for an identity crisis to come and for deepening tribalization as a result. Since 2012 the Chinese economy has had the lowest economic growth since Deng Xaoping. It was precisely the high growth figures that supported the policy of opening up and economic liberalization of Deng and his successors Hu Jintao and Jiang Zemin. Political reform was much less on the agenda, fearing another Tiananmen — no doubt the largest traumatic experience in China of the last 40 years. When Xi Jinping became the new president of China, the country’s economy was not doing well enough to keep the same pace of economic progress. Xi decided to solve this crisis by going back to strategies of Mao that Deng had left behind. In the name of corruption, Xi is purging the communist party, while externally the enemy is again the decadent West. Xi is again using Maoist style propaganda tools and creating a sort of Maoist personal cult. With his project of the “Chinese Dream” Xi tries to revive the tribal Maoist Chinese feelings. The question is if that works. It seems to, at least with a large amount of Chinese people. However, as Prof. David Shambaug noticed, the officials of the party and the government seem to have lost their belief in the project. If this is the start of the endgame, as Shambaug says, it will be seen in the years to come, and China may face the largest identity crises in its recent history. In 2014 India chose Narendra Modi as its new prime minsiter. He is a Hindu nationalist with a questionable past. He may be responsible for what some call an ethnic cleansing in 2002 in Gujarat, where he was chief minister. Since his rise to power there are an increasing number of reports of sectarianism in India. Christian and Muslim minorities are complaining about harassment and even mass conversions by fundamentalist Hindu groups that are affiliated with Modi’s party, the Bharatiya Janata Party (BJP). How far this sectarian violence will go is not clear, but there is no doubt that India too is on a fast track to tribalization. Globalization has been an unstoppable trend. However, there can be moments when globalization is halted or is even going in reverse. The end of the 1920s and the 1930’s was such a moment. Back then people lost their belief in international cooperation and in liberal democracy. The crash of Wall Street in 1929 accelarated an already existing identity crisis, resulting in tribalization and finally in war. All indicators show that the world is again reaching again a decline of globalization. The cause is to be found in a few traumatic experiences. For every continent these traumas are different, but the result is the same. There is a general loss of confidence, leading to a collective identity crisis. The reaction to these crises are similar: people look back to what they know best. They look for psychological security in their tribe, be it a religion, a nation or a party. This trend has been accelerated by the global financial and economic crisis of 2008/2009. Today we can say that the world has left the path of globalization and is taking the trail of tribalization. Unfortunately, history has shown time and again that nothing good will come out of this. Koert Debeuf is a political analyst of European and Arab affairs, based in Cairo. Former strategic adviser of the Belgian Prime Minister (2003–2008). Former representative of the Liberals and Democrats of the European Parliament (ALDE) in the Arab World (2011–2014). He is the author of Inside the Arab Revolution and of pieces that appeared in Foreign Policy, Politico, Al Monitor, EUObserver, Carnegie Europe, Fikra Forum (Washington Institute), German Marshall Fund of the United States, Le Soir. He is regularly asked as a political analyst by The Financial Times, The Independent, Le Figaro, France 24, BBC World Service, etc. He gave lectures at the Sorbonne and Oxford University. MA History, Universities of Leuven (Belgium) and Bologna (Italy).